I missed thinking about the bird populations when I began posting of what appear to be now called agroforests. We are going to see a lot more of these. The land diversion can be minimal while the underlying crop can be optimised with the use of modern equipment. It is monoculture without the total separation form the surrounding environment. The benefits are many and soon obvious. We now learn that we develop an improved bird population profile also and from that an improved insect population. I would also anticipate superior pollination from wild wasps. Were shading is in place, leaf fall additionally enriches the soils and it is common to find the thickest greenest grasses there. At the moment this is all in its infancy, but I do predict that it will dominate the landscape everywhere. An example that I can foresee is the growing of spaced rows of Gary oaks throughout the USA. The acorns are a food stock in their own right asking merely to be processed into flour and the leaves are a natural fertilizer. The tree itself can be induced to produce a long trunk opening up the ground beneath completely for cropping. The shade itself will induce a slower growing crop that is naturally much richer. Yet with the open space beneath none of the crop is ever in permanent shade. I cannot speak to other nut trees, but the same likely holds true for many. Our problem is that we have focused on small trees to facilitate orchard operations. Those trees are likely much less suitable. This is likely to change as operators perceive the benefits. It is all early days. University of Utah ornithologist Cagan Sekercioglu uses radio equipment to track an orange-billed nightingale-thrush in the Costa Rican countryside. A new study by Sekercioglu indicates that wooded "shade" plantations where coffee and cacao (the source of chocolate) are grown are better for bird diversity than open farmlands, although forests still are the best habitat for tropical birds. Credit: Mauricio Paniagua Castro. Compared with open farmland, wooded "shade" plantations that produce coffee and chocolate promote greater bird diversity, although a new University of Utah study says forests remain the best habitat for tropical birds. The findings suggest that as open farmland replaces forests and "agroforests" - where crops are grown under trees - reduced number of bird species and shifts in the populations of various types of birds may hurt "ecosystem services" that birds provide to people, such as eating insect pests, spreading seeds and pollinating crops. "We found that agroforests are better overall for bird biodiversity in the tropics than open farms," says study author Cagan H. Sekercioglu (pronounced Cha-awn Shay-care-gee-oh-loo), an assistant professor of biology at the University of Utah. "This doesn't mean people should farm in intact forests," the ornithologist adds. "But if you have the option of having agroforest versus open farmland, that is better for biodiversity, with shade coffee and shade cacao [the source of cocoa and chocolate] being the prime examples." Sekercioglu's new study, funded by the University of Utah, is being published this month in the Journal of Ornithology. He will present the findings Thursday, Aug. 9, at the Ecological Society of America's annual meeting in Portland, Ore. If consumers wish to support bird diversity and agroforests, "a good way is by choosing certified, bird-friendly, shade coffee or shade chocolate," he says. While such coffee or chocolate often cost more because they are more labor-intensive to produce, the certification "is usually better for the farmers' income as well." He adds: "There are trustworthy environmental organizations that certify shade coffee," including the Smithsonian Institution, the Rainforest Alliance and the Rainforest Action Network. Other crops grown in shade include cardamom, which is a spice, and yerba mate, which is steeped in hot water to make a beverage popular in South America. An agroforest "is a type of farm where the crops are grown under trees at a reasonable density," Sekercioglu says. "Often, it's not like forest-forest - it feels more like a open park," although in Ethiopia "commercial coffee is grown under full-on forests in its original native habitat." Sekercioglu conducted the study in two steps. First, "I used my world bird database that has information on all the 10,000-plus bird species of the world," he says. "I sorted birds based on habitat choices and compared species that prefer forests to those that prefer agricultural areas and others that prefer both forests and agricultural areas." Next, he reviewed about 40 previously published studies that examined bird communities in forests, agroforests and open agricultural areas. "The global analysis of all the birds species mostly agrees with the findings of detailed local bird studies," Sekercioglu says. The study focused 6,093 tropical bird species, including migratory birds, in which their top three habitat choices (out of 14 possible habitats) included forests, farms or both, with the latter described as agroforest birds. So the study found 4,574 bird species that include forest but not farms in their top three habitats, 303 species that include farms but not forests in their top three habitat choices, and 1,216 agroforest species tha include both forests and farms among their top three habitats. The findings suggest, but don't prove, that conversion of forest to farmland may reduce ecosystem services, which are services birds provide to people. + Insectivores or insect-eating birds do best in forests - especially those that live near the ground in the understory, the layer of plants below the tree canopy and above the ground cover. But small and medium insect-eating birds, especially migrant and canopy species, do well in agroforests. The number of insect-eating species declines on open farms, where they help control pests. + Frugivores or fruit-eating birds, especially larger ones, "do best in forest because they have more habitat and more food, and the large ones often are hunted outside forests in agricultural settings. Overall, frugivores - especially smaller ones - do OK in agroforests, but the number of fruit-eating species decline significantly on open farms." Frugivores help spread the seeds of the fruits they eat. + Nectarivores or nectar-eating birds help pollinate many plants. 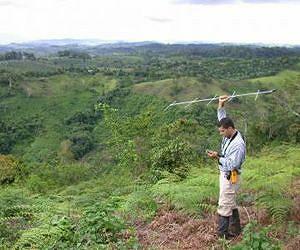 They "tend to increase in agroforests compared with forests. A lot of nectar-eating birds obviously like flowers, and many plants flower when there's some light. When you have extensive forest its often pretty shady so not many things are in flower at any given time." The nectar eaters are less common on open farms. + Omnivores, which are birds that eat many things, "tend to do better in agroforests and especially on open farms" than in forests, because their diet is so generalized instead of specialized in certain foods. + Granivores, or grain- and seed-eating birds are "the only group that significantly increases in open agricultural areas. A lot of the seeds they eat are grass seeds, but also from crops. Some of these seed-eating bird species are major agricultural pests, and that's another reason for encouraging agroforests. In completely open agricultural systems, you have more seed-eating birds that can cause significant crop losses." While the study found fewer species on farms than in agroforests, and fewer on agroforests than in forests, Sekercioglu says it doesn't answer a key question: "Does the decline in the number species translate into a decline in individuals providing a given ecosystem service?" If so, farms and agroforests have lost birds that provide important insect-control, pollination and seed-dispersal services. "It is possible you may lose a lot of species, but some of the remaining species increase in number and compensate and for the decline in ecosystem services by the lost species," he adds. "It's one of the biggest questions in ecology." Noting that the study found forests have more tropical bird species than agroforests, which in turn have more bird species that open farms, Sekercioglu says: "A lot of threatened species globally are found only in forests, and most of them disappear from agroforests and open agricultural areas." He says many migratory birds that breed in the United States are in decline - even though the nation has a law to protect them - and not just because of U.S. environmental problems, "but due to problems in their winteringgrounds in Latin America, such as loss of habitat and intensification of agriculture." "Coffee was originally a mid- to high-elevation African forest understory plant," he adds. "For centuries in Ethiopia and parts of Central and South America, coffee has been grown as an understory plant with shade traditionally provided by native trees." But fungi can be a problem in humid shade coffee plantations, and growers have come up with varieties that grow well in the sun with less fungus and bigger yields, so in recent decades, there has been a trend toward converting Central and South American shade-coffee forests to open farms, Sekercioglu says. "As tropical forest is converted to increasingly open types of agriculture, hundreds of endangered bird species are being lost," he says. "Tropical forest is the only refuge for thousands of bird species and hundreds ofendangered bird species. Although agroforest is better than open farmland, at the end of the day intact tropical forest is the only suitable habitat for thousands of bird species." There is a downside to that, if it is a single crop agro forest, it is more destructive. Eucalyptus forest in the Philippines hastily planted to combat erosion from logging are devoid of birds. The oily tree do not harbor insects that the birds eat. Ergo, a silent forest only the wind song.